Shepton has enjoyed the year round energy generated by the inventive and very successful Rubbish Art Project in the old HSBC Bank in the Market Square. If you haven’t yet been in to see how the building, renamed “The Art Bank”, has been transformed, then you’ve got a treat in store. The Art Bank has now secured a lease ensuring its continuity for at least the next three years. It’s a fantastic boost for the arts in Shepton. The success of the project has been recognised and supported by the Town Council where recently we gave a grant to enable local people to participate in a major event in the coming months. This is of course great news for the vitality of the town, but this now means that this building is no longer available as one of the possible sites to rehouse our library. The Friends of Shepton Mallet Library are now hoping that they can convince the County Council to keep the library in its current location. This would be with financial help from the Town Council and a generous offer of support from Michael Eavis. The Town Council remains unconvinced that moving the library to the Mendip District Council SHAPE office can sustainably serve the community’s needs. Shepton’s Library will continue to be at the centre of our thoughts until we can find the best way to resolve its long term future. 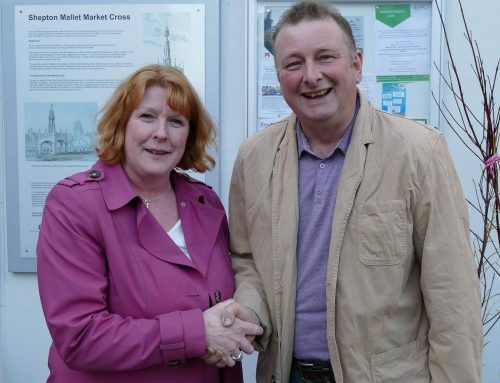 Last week I attended a meeting to discuss the resurfacing of Town Street and the Market Place. At the moment we have a total of around £300,000 available from various sources to execute these urgent works. £130,000 comes from Somerset County Council, £70,000 from money obtained by Mendip Council from agreements from developers, and £100,000 has been promised from your Town Council. Sadly, and perhaps predictably, it has now become apparent that the costs for the proposed scheme have increased. It means that we may have to revisit what can be achieved on the original budget, or find a way of raising further finance to achieve what is best for our town. The various options will be considered and discussed on the 22nd January at the Town Council meeting. I can only hope we can find a way to make the town centre safer and much more attractive in the near future. We will be holding a meeting this Thursday (17th) to discuss how to develop a successful Neighbourhood Plan. We welcome everyone in Shepton who wants to participate in this very important project. We have already had the chance to meet hundreds of people at the Sunday Markets and now want to move the plan forward. Please join myself and John Parham in the Library at 6.30pm. We have ageing (and recently defective) play equipment in Collett Park that has been causing us concern. Thanks to our Town Council staff, the play equipment has been made safe and is now up and running again. It was pleasing that the council officers received praise for their speedy work from parents whose children enjoy visiting our lovely park.